The story is pretty unnecessarily complicated, but it basically boils down to the following: In the near future, Terminators reign supreme and the humans are facing a losing battle. Robocop arrives in the future and must destroy Skynet to stop the production of the Terminators, and hence, save the world. Obviously, there's a few people who don't quite agree, and they must be disposed of! The game is pretty much a typical scrolling arcade/platform/shooter. It isn't totally linear and there are several levels to explore, with ladders, chains, pipes, etc. to climb to reach your destination. The constant stream of enemies in front of you does get repetitive, and with only 1 hit required to kill the enemy, it's a bit easy. In fact, you can pretty much breeze through most of the levels just constantly hammering on the 1 button, as there's no limitation on ammunition. I personally found the most difficult parts of the game to be navigating past certain hazards as opposed to the enemies that were supposed to be causing me trouble. As with most games of this genre, there's a boss at the end of every level who typically has a huge weapon and takes a fair few hits to kill. They're not particularly difficult to dispose of, but some of them can take a while and a lot of patience! The graphics are definitely above average for the console. The backgrounds are generally quite detailed, and the characters stand out enough to be distinguishable. There are a few areas of plain black background, but that's usually the night sky, so I suppose I can forgive it. 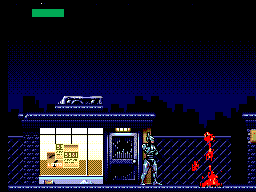 The animations of Robocop are nice and smooth, although there is a bit of slowdown when you rapidly fire your weapon. The huge blood splatter when enemies are shot is also a nice feature! Well, the sound is usually a big disappointment for the Master System. However, personally, I think the sound is great for this game. 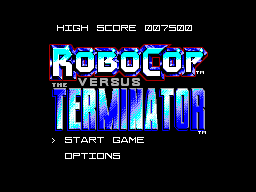 The theme music which plays over the introduction is superb, as is the background music which plays during the levels. 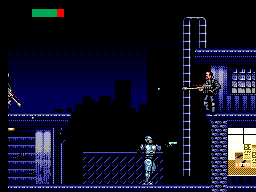 You even get comments from Robocop at the beginning of each level, usually a one-liner of typical wit and enthusiasm. The weapon sounds are fine, and they actually sound significantly different from one another, which is a nice change. The controls are as simple as they get - 1 for fire, 2 for jump, D-pad to move. There aren't any issues with responsiveness, and I can't really see any way which they could've been improved upon! Slightly annoying that you have to get up to pause, but hey, that's hardly the game's fault! The game is pretty good, but it definitely becomes repetitive after a while. The different levels are different enough to hold your attention, but this isn't a game you'll want to replay over and over. You might come back to it occasionally though, and when you do, you should still find it enjoyable enough. Definitely an above average game for the system, only slightly spoiled by the repetitive nature of the gameplay; walk and fire, walk and fire, jump, walk and fire... But saying that, there's still enough here to keep you interested long enough to complete the game. This is a worthy purchase for any Master System owner!